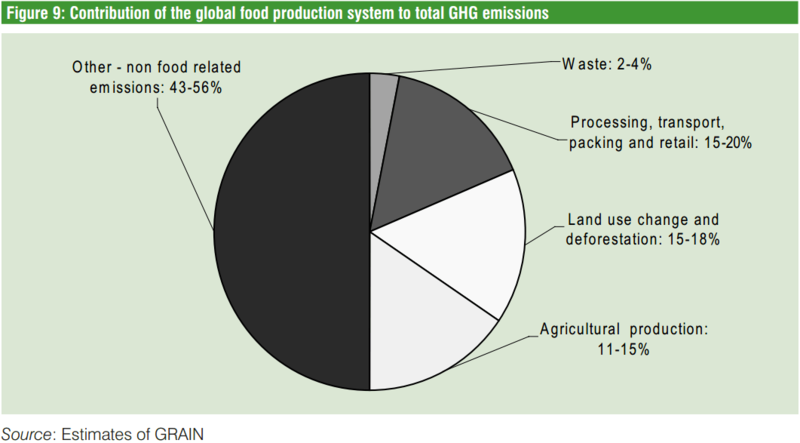 How Much of World’s Greenhouse-Gas Emissions Come From Agriculture? Agriculture might seem green by definition, but farming accounts for a lot of greenhouse-gas emissions when the entire food production system is taken into account. Typically, estimates of greenhouse-gas emissions from agriculture are around 11%-15% of global emissions. Estimates discussed last month at the United Nations Climate Summit put that number closer to 50%. This is an important calculation as climate change issues come to the fore, with record greenhouse-gas emissions and international negotiations to halt the rise. The reason for the difference is that the 11%-15% estimates only take into account emissions from the farming part of agriculture, such as plowing and fertilizing. The U.S. Environmental Protection Agency’s 14% estimate, for example, includes emissions from agriculture’s mechanical equipment, soil management, enteric fermentation (which produces, say, belches from a cow), manure management, rice cultivation and field burning. It doesn’t include transport, food processing, packaging, and sale of agricultural products. The 43%-57% estimates, which are published in the United Nations Conference on Trade and Development‘s 2013 Trade and Environment Review, look at food production more broadly to also include emissions from land-use change and deforestation, as well as the processing, packaging, transport and sale of agricultural products. The estimates come from Grain, an international nonprofit research foundation that contributed to the U.N. report. It analyzed existing data on global emissions to determine the full extent of agriculture’s emissions. Agronomist and coordinator at Grain, Henk Hobbelink, says the solution to reducing agriculture emissions lies in small farming and decentralized food systems. Hobbelink advocates smaller-scale farming, which use traditional practices like cover crops, low tillage and organic fertilizer that reduce carbon in the atmosphere without adding a lot more to it. Another area of emissions waste comes from the fact that much of agricultural production doesn’t go directly to human consumption, but rather to animal feed and biofuel. Of what does go for human consumption, a third is wasted.